The following post was written by Courtney Trahan, Admissions Representative at IYRS School of Technology & Trades. 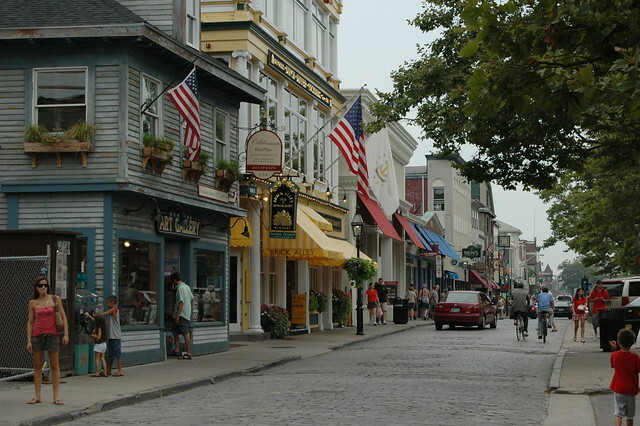 Courtney resides here in Newport, RI and loves nothing more than sharing her recommendations with you for things to do in the beautiful city-by-the-sea! Every time I go somewhere new, I like to jam-pack as many touristy sights, fun activities, and hidden gems into my travels as much as I can. The first time I went to Philadelphia for the Army-Navy football game, I looked up the top things to do in the city and decided to accomplish them all by foot. I was not wearing proper sneakers, and the next day my feet hurt so bad I could barely leave my seat at the stadium. Our registration for Open House begins at 9:30 am, and our program will start at 10:00 am. You may be staying at a hotel or Airbnb, or able to come to town a few hours earlier, so I will lay out some itinerary options to consider both before and after your day here on campus. Breakfast: I suggest stopping at Corner Café at 110 Broadway in town. This place tends to be busy on the weekend mornings, but the offerings are delicious. They always have amazing omelettes and pancakes, and often have fun specials on their items. If you want to come closer to campus, park in our parking lot and walk to Peaceable Market at 520 Thames, they have amazing breakfast sandwiches. Coffee: Mokka Coffeehouse is basically part of our parking lot when you drive down Spring Wharf. We will have some coffee and pastries at Open House, but if you need a pick-me-up before 9:30 am, they have tons of options and are great friends and neighbors to us. Say hi to the friendly faces behind the counter! 10:00am – 12:00pm: Open House at IYRS! Come check out what makes IYRS unique. You may take this time to utilize open campus and walk around at your leisure. I recommend checking out the Coronet Restoration Project behind our Restoration Hall. Coronet is a beautiful 135-foot wooden schooner being restored on our campus and you can read the history and see the project’s progress and read tons of information along the catwalk. Walk out on our back dock near the marina to check out the bridge and the beautiful harbor views. If you leave campus and head to lunch, I’ll offer some suggestions! There are a lot of options for lunch depending on what you are looking for. If you came to Newport looking for seafood, I recommend leaving your car parked at IYRS and walking back down Thames Street and America’s Cup Avenue to check out spots along the wharfs. Some highly recommended spots are Midtown Oyster Bar or The Mooring Seafood Kitchen & Bar. Another fun place for Lunch is Megs’ Aussie Milk Bar up on 111 Bellevue Avenue. Megs’ is an awesome environment with an Australian theme. I find the menu to be a cool twist of things we would see in a regular American café, coupled with some dish options that I personally had never seen or tried before! There are a ton of things to do in the afternoon, even in the offseason. I am a big fan of sunsets, and weather permitting, there are still great opportunities to check out the spots outside and be along the water – just bundle up! Save The Bay, an incredible organization dedicated to protecting the Rhode Island waters and coastline, is hosting a Seal and/or Lighthouse tour and tickets are available on their website savethebay.org. This might be one of the only opportunities to be on the water at this point in the year since most schooner tours do not run in the winter months! They will depart from Bowen’s Ferry Landing at Market Square. 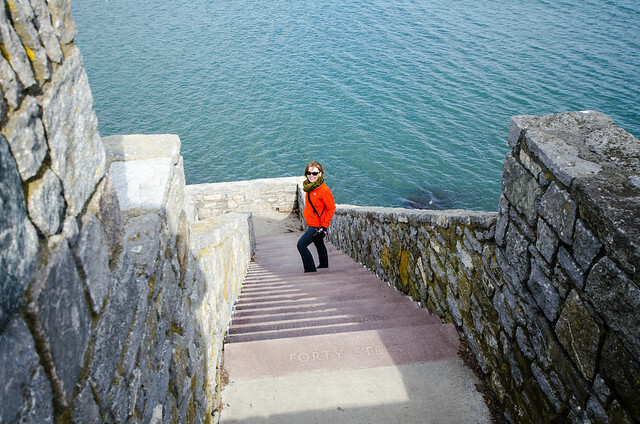 Two of my favorite spots in Newport are Fort Adams State Park and the Cliff Walk. Weather permitting, if you are looking to be more active, I recommend taking a walk at one or both of these spots. The Cliff Walk can be accessed at many points along Bellevue Avenue depending on where you park, but changes terrain depending on how far you get from the main stretch by the mansions. If spots are available, park along Narragansett Avenue and check out the Forty Steps! This is a great way to walk and see the mansions if you do not want to take a mansion tour. Fort Adams is an incredible historic fort to walk around. Guided tours are not available at this point in the season, but you are still able to walk around the public paths and it is a great spot to see the bridge, the water, and watch the sunset. If you’re coming with a family, check out Ryan Family Amusement at 268 Thames Street for fun arcade, skills, and video games. The Third and Elm Press is open until 5 pm on Saturdays. The Admissions & Marketing team took a walking lunch over the summer to discover this incredible gem. It’s located at 29 Elm Street, and there are incredible 19th century printing press machines you can check out and purchase beautiful, intricate handmade cards, books, and pictures as well as learn about the process. You should be able to park on the streets in this area (The Point) and can walk along the water here as well. Although the sun sets early this time of year, and it might be a bit chilly, there are still a ton of fun things to do in the evening if you are sticking around in town! If you checked out Third & Elm Press and you’re still in a shopping mood, stroll along Long Wharf Mall! You have to stop in the Only In Rhode Island store for unique state pick ups like clam chowder, Del’s Lemonade mix, and most importantly – Autocrat Coffee Syrup for your coffee milk. There are tons of bars and restaurants along Thames Street and Broadway to grab food, drinks, or catch a game, but if you want a different activity, I recommend checking out the Bit Players or some live music at Parlor Bar & Kitchen near by! The Bit Players are an incredible comedy troupe that put on a fun show at the Firehouse Theater located at 4 Park Equality Place. Their tickets are $18 just general admission and their shows are definitely a good laugh! If you’re in town for dinner, definitely check out Perro Salado at 19 Charles Street! The adorable home-like aesthetic, and the fresh south of the border dishes make this definitely one of my favorite spots. If you’re of age, I highly recommend the blood orange or cilantro-jalapeno margarita – they are absolutely amazing. The pineapple has been the symbol of hospitality and an iconic symbol in Newport since the 1650s. A pineapple was placed outside the home by many sea captains and voyagers when they returned home to show a safe return, encourage visitors, and welcome guests. I have taken up running and I am building up to marathon training slowly through the coming months. One of my favorite activities to do while passing the time on long runs through the streets of Newport is to see how many homes and businesses have pineapples on them. Don’t forget to count the pineapples as you’re exploring around! I hope you have a wonderful visit and our Admissions team has many more suggestions (you can ask us about when you’re at Open House) if you are looking for something different or are prepared to walk!